Why all the Bible translations? People want to understand God. When you can read God’s word in your own ‘heart’ language it is much more accessible to the common person. Translations come about when there is a need to get a more ‘understandable’ version than what is commonly available. Bibles are usually translated by a diverse group of people. I am always wary of any translation of the Bible that is created by one person for one group of people. A Bible translated only for a single purpose is never a good idea. Look for a Bible translation that involve many people from different denominations and skill levels. How do I know which English Bible to use? 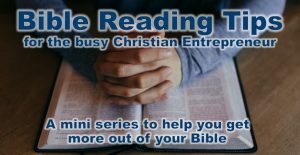 What type of Bible should a Business Owner use? There are a lot of translations of the Bible in many languages. A business owner must look for a Bible that communicates in a way that is understandable. Many people like the King James Version, but I find the thus, thous and whereforto’s, to be a bit distracting. Plus, our language has evolved since the 1600’s, so you would expect it to sound a bit different. This article is not a debate about the King James Version or any other. Some people like the poeticism found in that version of the Bible and that is perfectly fine. Each translation has its own good and bad points. People want to understand God. When you can read God’s word in your own ‘heart’ language it is much more accessible to the common person. Translations come about when there is a need to get a more ‘understandable’ version than what is commonly available. Bibles are usually translated by a diverse group of people. I am always wary of any translation of the Bible that is created by one person for one group of people. A Bible translated only for a single purpose is never a good idea. Look for a Bible translation that involve many people from different denominations and skill levels. I suggest getting a translation in the dynamic versions to start, but if you have the ability I would read a little from each type of translation. With our technology, we have apps and webpages that can easily pull up more than one translation. On Bible Gateway, there is even a way to create a parallel versions side by side, so you can read the same passage and see how it was translated by others. If you want to study more about the different types of Bibles, Swap Meet Dave has a great article called “Holy Bible Versions and Types.” He gives a breakdown of each Bible translation, when it was published and how it reads.